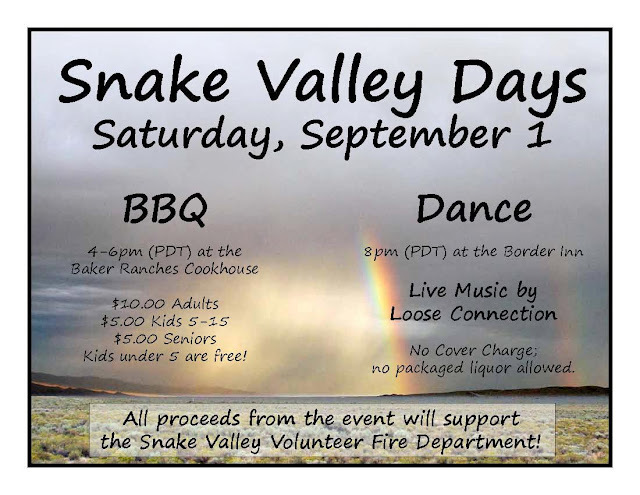 Come to Snake Valley Days! This summer a number of pinyon pines along the park road turned red quickly. Many people asked what was going on, and the park asked a Forest Service entomologist who specializes in tree pathogens and insects to visit. She examined the trees and found two insects: pitch mast borer and sawfly. Pitch mast borer goes into the bark and the tree reacts by pushing out big balls of sap along the trunk. Sawfly enters via the needles and lays larvae that then cause the needles to fall out. Trees attacked by sawflies typically appear to be very sparse and have lots of red needles under them. Trees don't die from pitch mast borer or sawfly alone, but both of those weaken the trees. The combination of them along with the trees being in a pollution corridor and receiving extra salt in the winter and being in a drought most likely did them. I took some photos of the dead trees and then after a saw crew from Sequoia/Kings Canyon National Park cut them down. 1A Near turnoff to Baker Creek road, before cutting. 1B. Near turnoff to Baker Creek Road, after cutting. 2A. Approaching dump station, before cutting. 2B. Approaching dump station, after cutting. 3A. At dump station turn, before cutting. 3B. At dump station turn, after cutting. Most of the trees were chipped. The saw chips will cook in the heat of the day and kill the insects in them. The bigger limbs were cut up and will be used for fire wood in the interpretive programs. Southern Snake Valley started school August 15. Mrs. Phillips has thirteen kids in grades K-2 in Garrison. Mrs. Yacapraro has 18 kids in grades 3-6 in Baker. I'm not sure how many kids are in junior and senior high in EskDale, but I've seen them getting on the bus with the early morning sun not high over the Confusion Mountains! Wheel-a-thon September 11: Garrison kids bike 8 miles, Baker kids bike 16 miles to raise money for school activities. Volunteers are needed and can call the Baker school at 775-234-7333. Harvest Festival, November 9: This is a fundraiser at Baker Hall. Potluck dinner followed by an auction. Auction items and folks to buy those items are needed. Christmas Program, December 19: This may be the best-attended event in the valley. Watch the adorable kids as they put on entertaining plays and share their musical abilities. Sometimes someone with a white beard comes at the end. The BLM released the final EIS for the for the Southern Nevada Water Authority (SNWA) pipeline project. They selected Alternative F, a new alternative that has appeared since the draft EIS. This alternative does not call for development in Snake Valley at this time, but an SNWA attorney states in this article that Snake Valley will be pursued in the future. To download the EIS or to request a hard copy, visit the BLM page. To see a compilation of articles relating to this project, visit the Great Basin Water Network page. Comments are accepted by the BLM until October 1, 2012.